I decided to whip up some quick and easy Spinach Alfredo Pizza with some fresh spinach from the farmers market this week, and it was a huge hit! Believe it or not, spinach is one of those veggies I can add to almost anything and my kids will eat it without complaining. And I love having baby spinach handy for mixing up quick salads during the week–especially if I’m craving a light, healthy lunch. Of course, tomatoes aren’t available at my farmers’ market yet, so I picked those up at the grocery store. I used a jarred Alfredo sauce, but you can certainly use a homemade sauce if you prefer. 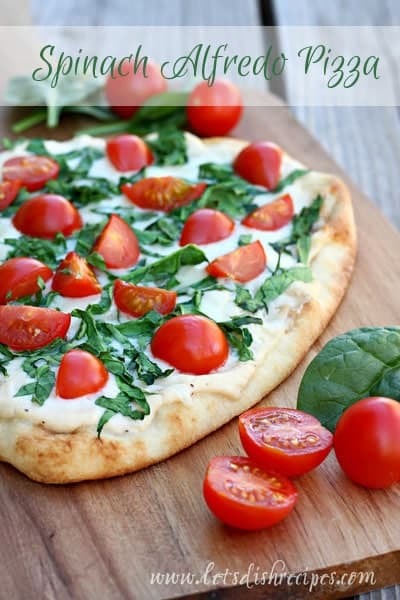 For the crust, I used a store-bought naan flatbread, but pita bread would work just as well. 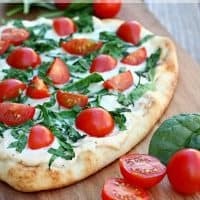 These pizzas were ready in about 15 minutes, and so easy that my kids can make them on their own–although they prefer to leave out the tomatoes. Spread 1/4 cup of Alfredo sauce evenly over each flatbread. Sprinkle the cheeses over the sauce. Sprinkle the chopped spinach over the cheese, followed by the tomatoes. Season pizzas with salt and pepper, if desired. Place pizzas on a large baking sheet and bake for 10-12 minutes, until cheese is melted and spinach has just begun to wilt. Oh my- it’s gorgeous Danelle & scrumptious too! WOW! Those colors! So vibrant! This looks fabulous Danelle!